Last Monday nine Toronto start-ups gathered on the lower level of MaRS to persuade wealthy investors to fork over some money - lots of it. This Venture Day was the culmination of the innovative Next 36 program where four person teams comprised entirely of Canadian university students had been challenged to create a mobile app (and company) with a starting budget of $50,000. As I stood at the back of the packed room listening to pitch after pitch I couldn't help but admire these guys. Almost all of the start-ups were pre-revenue (and in many cases still pre-launch with zero users/customers) yet valuations were being floated in the million dollar range. Some had already raised money. Others had plugged-in advisors ranging from the Managing Director of Facebook Canada to the founder of ATI Technologies. Some will succeed but many will likely fail. Here's a summary of the nine teams that presented that day. Which ones do you think have the most and least potential? This mobile app is trying to improve the online/mobile shopping experience by making it easier for shoppers to visualize what a dress, pair of pants or sweater might look like on their body. To do this, they've attempted to use 3D technology to create a photo-realistic model of the shopper - one that can be created easily by snapping a few photos on the iPhone and entering in some measurements. If they can get the technology to work they might have a hit but I foresee challenges signing up enough retailers to make this anything more than a niche product or one that a better equipped and financed tech start-up can out-innovate them on. When I first saw this app presented on BNN I wasn't that impressed but their well packaged presentation at MaRS had me re-thinking my first impression. The main objective of this social app is to make it easier for people to meet each other, flirt, or otherwise break the ice at a bar or nightclub. While I'm lukewarm on the interface or the use case itself, what's impressive is the team has made strides in signing up advertisers and bars who are interested in being involved as a way of increasing brand preference and bringing in new customers. The fact that Jordan Banks is both an advisor and investor also works in their favour. 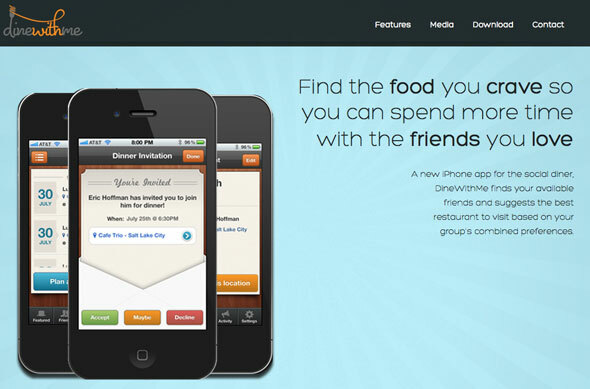 This social dining app wants to make it easier for friends to find and agree on restaurants to eat at. Sounds good so far. What's less convincing is their revenue model to sign up restaurants to pay to target ads to these would-be-diners. I'm just not convinced that anything but the Jack Astors and other chain restaurants of the world are going to be easy to sign up for this - and those are exactly the type of restaurants that if I were a user I wouldn't expect (want) to show up in my recommendation list. So much for discovering hidden gems. If they manage to sign up places like Keriwa Cafe or Korea House than maybe I'll become a believer. After first hearing this pitch I thought Playfit Mobile might have the most potential of the bunch. What they're attempting to do is provide a platform for companies and brands to incent employees or customers to live a healthier lifestyle. Think rewards like free movie tickets if you go to the gym three times. After some astute questioning by the audience, I started to have my doubts .The main stumbling block seems to be tracking the behaviours. In other words, how do you know they actually went to the gym and broke a sweat? If the Playfit Mobile team can overcome this obstacle I think they might have something here. But if not, I don't see success. This one seems to be the least likely to succeed. While I agree with the premise that email marketing isn't ideal, I just don't see how this team can succeed in a rapidly evolving space that seems already saturated with both massive global companies (Facebook, Google, Skype/Microsoft) and Silicon Valley start-ups. Essentially, what PushPal offers is a mobile platform that allows users to more easily control what brands they want to hear from. I wish them luck. Even though Winston is a copy-cat of the much buzzed about Uber currently operating south of the border I like their potential simply because of the first-mover status in Canada and the fact Uber has already demonstrated this business can work. What's smart is they're already signing up trial accounts with the Canadian offices of companies like McKinsey and Company, PWC and Deloitte and Touche - the very companies whose employees take a lot of cabs and can benefit from the better service and streamlined payment/expense offerings that Winston plans to offer. On the downside, the scope of their business is probably limited to Canada. We previously mentioned Posterboard earlier this month. As a reminder, Posterboard is attempting to create something of an amateur Getty Images/Associated Press where ordinary citizens would take photos of compelling and random news/events on their mobile apps and media companies would pay a small fee for exclusive rights to use the photos. While I could see this working for certain types of content, I think the main challenge here is the ol' chicken or the egg. In others words, I don't see wide option of Posterboard by users until media companies are using it, and I don't see media companies using it until it has a large user/photo base. 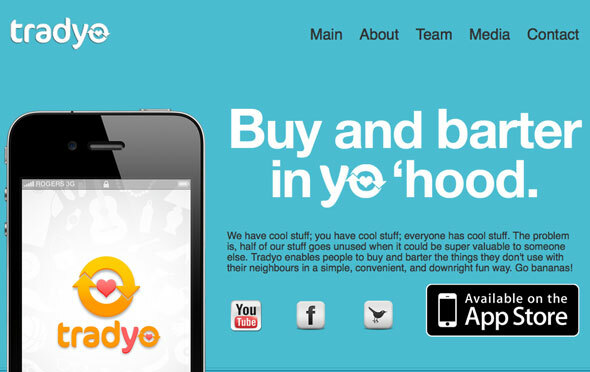 Tradyo is sort of a community Craiglist/Kijiji for the mobile phone. While I like that they've already launched and have consummated transactions, there's just so much competition in this space I feel it's going to be difficult for them to succeed. No less than these five companies are already in the space and with web based incumbents also likely to play a role the winner here is likely to be the one who can grow their marketplace the fastest. No matter where I go I'm always being confronted with surveys to tell businesses what I think of them. Usually I don't bother. Whatdyathink hopes to change that and take advantage of my downtime while I'm waiting in line to give a bit of feedback. Oh yeah, I could use this. Every time I'm at the Canada Post office at Queen and Carlaw I want to vent how long the line-up is and tell Canada Post they need to staff it with two attendants. But I never bother to give this feedback because, well, I'm too lazy to make the phone call to some customer service number I don't know about. If I was prompted by a feedback form on my iPhone that might just work.